11/9/2017–MOCKSVILLE, NC–The Sugar Valley Composite Squadron was honored to have one of our cadets serve as speaker for our October meeting. C/CMSgt Caleb Padiak’s topic was “The Quiddity of Respect.” Cadet Padiak has taken on more of a leadership role in the squadron and has learned the value of respect. "Quiddity" is defined as the essential nature of something. Cadet Padiak cited respect, one of the CAP Core Values, as the basis for the other Core Values of excellence, integrity and volunteer service. "None of the other core values necessarily indicate the presence of the other values in the same way. This is because respect stems from the core issue of inherent human value, which deserves significant attention and the utmost respect." "It is almost as if respect cannot be created or destroyed, but only distributed. Interrupting another person is giving yourself the respect that should have gone to them. If humans are inherently valuable, and value inherently deserves preservation, and failure to respect humans inherently does not preserve them, then respect is inherently necessary." 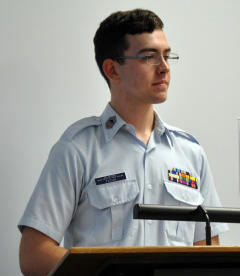 Cadet Padiak offered two examples from history: the Holocaust and slavery in America. Padiak stated: "The Jews were viewed as less than human, and Hitler was viewed as the ultimate human. All respect was taken from the Jews and given to Hitler. There was both a lack of respect, and an excess of respect. The results show us that they were equally dangerous moves. Slavery had the same root issue. When the Africans were viewed as less than human, and we viewed ourselves as the ultimate humans, all respect was taken from them and given to us. Again, a lack of respect and an excess of respect." "We see amazing things happen when there is a lack of respect, and we see equally amazing things happen when there is strong respect." Padiak gave the example of a young private in Iraq who threw himself over a grenade to save the other members of his team. The private had warned the others about the grenade, but they did not listen, and his respect for their lives saved them, even though he was killed. And what about self-respect? "Self-respect is having respect for your future self. If you respect your future self, then you will be responsible and wise to the best of your abilities in everything. Being in Civil Air Patrol is a great first step. To everyone, and Cadets especially, do not miss your chances to show respect." Squadron and community members responded with a standing ovation to the wisdom and insights shared by Cadet Padiak. This was a reminder of the importance of demonstrating respect in deeds and words, honoring that most important CAP Core Value of Respect. Since doing his talk, C/CMSgt Padiak has promoted to the grade of C/2d Lt, and has earned the Mitchell Award.